We have repeatedly heard that the biggest challenge to success with Activity Insight is loading publication citation information. This is especially frustrating when the information already resides in other software systems. In response, we made it a top priority to enable faculty to easily bring publication data into Activity Insight. Web of Science Imports is our fifth major import feature in this regard, following BibTeX Imports, PubMed Imports, Crossref Imports, and Web of Science Imports features. With Web of Science Imports, faculty can now pull their citations into Activity Insight directly from Web of Science without first saving them into a BibTeX file. Web of Science contains more than a billion cited references and counting, including books, journal articles, patents, websites, conference proceedings and Open Access materials dating back to 1900. Web of Science is a painstakingly selected, actively curated database of the journals that researchers themselves have judged to be the most important and useful in their fields. Select the Intellectual Contributions screen. Here you will find the Import button. Select this button. Next enter your search criteria. If you leave this section blank and click Continue, Activity Insight will search Web of Science for publications that match your name, or the name of the user for whom you are importing citations if you are managing data for someone else. You can enter additional search criteria by choosing Add search criteria and entering your search parameters. If you change your mind, you can use the Trash icon to remove a search criterion. Once you have selected your search criteria, click Search Web of Science. 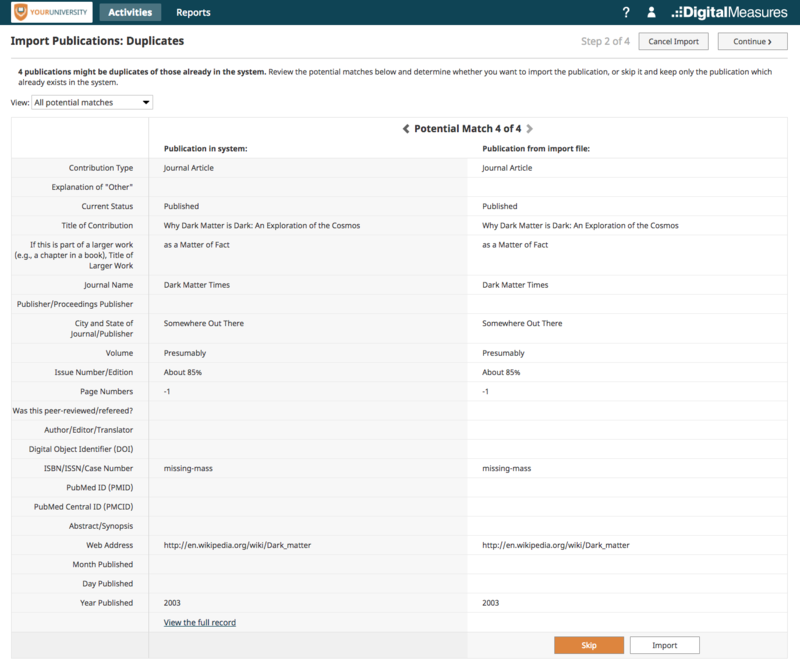 Activity Insight will return the citations found in Web of Science that match the search criteria you entered. To select the publications to import, choose the check box at the top to Select All, or check the box next to individual items. If you are uncertain about a citation, click the article title, which will show you the full set of details that will be imported into Activity Insight for that publication should you choose to proceed. Once you have chosen the publications to import select Continue. If too many publications were returned or the publication you expected to find does not appear, you can hone your search right from this screen. Select the modify your search link, update your criteria and select Search Web of Science. 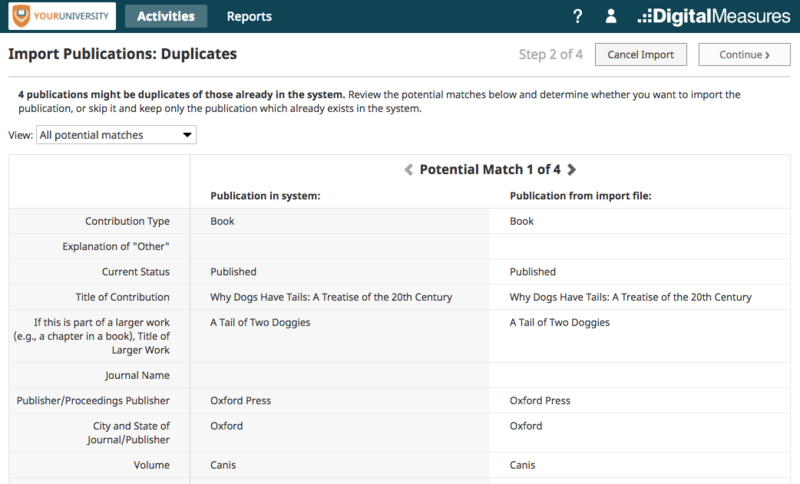 Activity Insight uses advanced duplicate detection logic to check the publications to see if any might already be in the system. We do not want duplicates! The publications that might be duplicates are presented to you for review. As you can see here, one potential duplicate was found. For each potential duplicate publication, you must choose Skip or Import. You can limit the publications that are displayed to all publications or only those that still need review using the drop-down menu at the top. 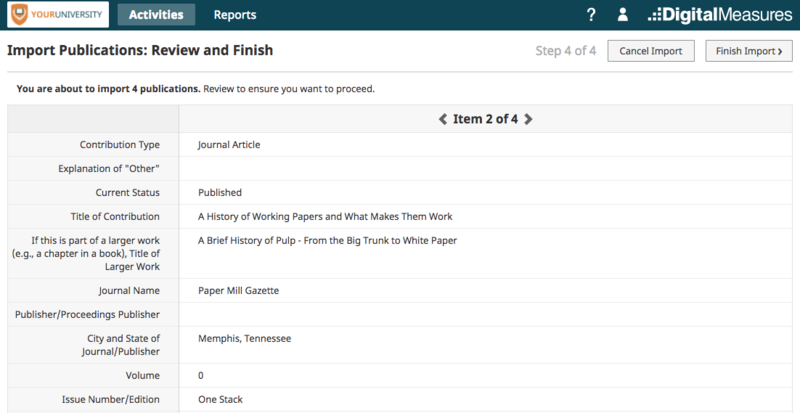 Once you have indicated whether each publication is or is not a duplicate, the Continue button becomes available to select in the upper right corner of your screen. Select Continue. Possibility A: It matched multiple names in Activity Insight, in which case you will see the message X potential matches. Select correct user account. 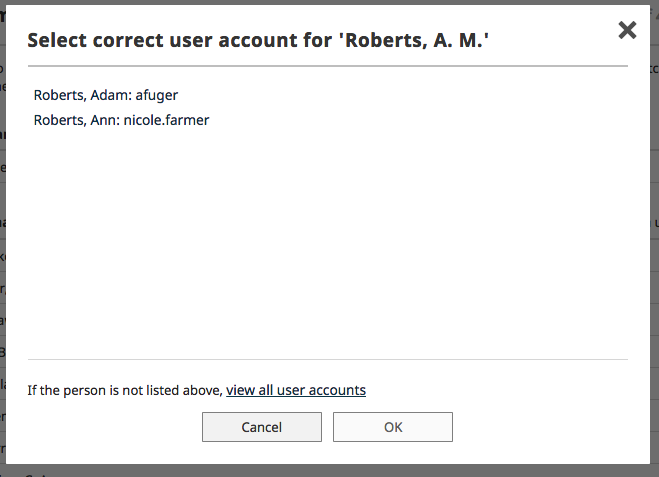 Selecting the link If the person is not listed above, view all user accounts will load all of the user accounts in Activity Insight to enable you to select the user from your campus. If there are no matches with any user accounts, selecting the No Matching Account button will update the selection on the Pick Collaborators main screen to Match to a user account, meaning a link to a user account will not be made. 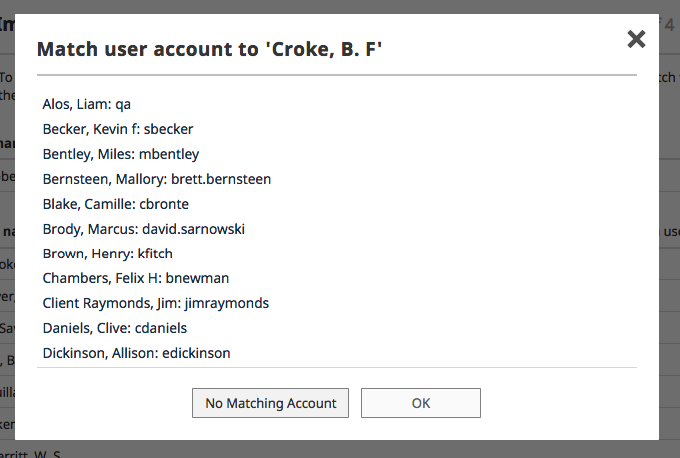 Possibility B: The collaborator matched just one name in Activity Insight, in which case you will see the name of the user account that was matched with the text after it of Select a different user account. 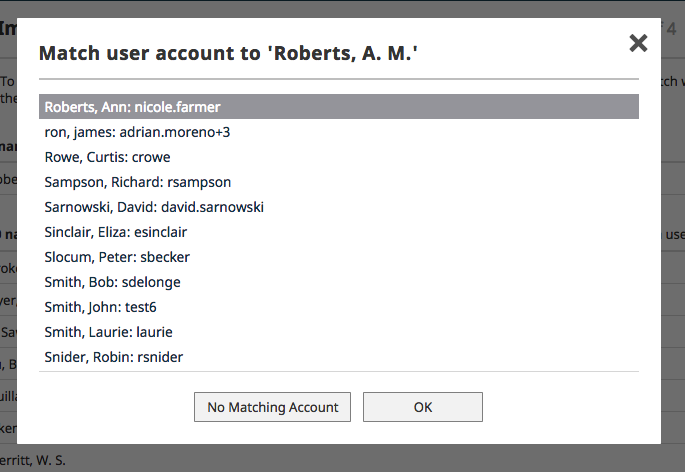 Possibility C: The collaborator did not match any names in Activity Insight, in which case you will see the message Match to a user account. Selecting the button No Matching Account will maintain the selection on the Pick Collaborators main screen of Match to a user account, meaning a link to a user account will not be made. 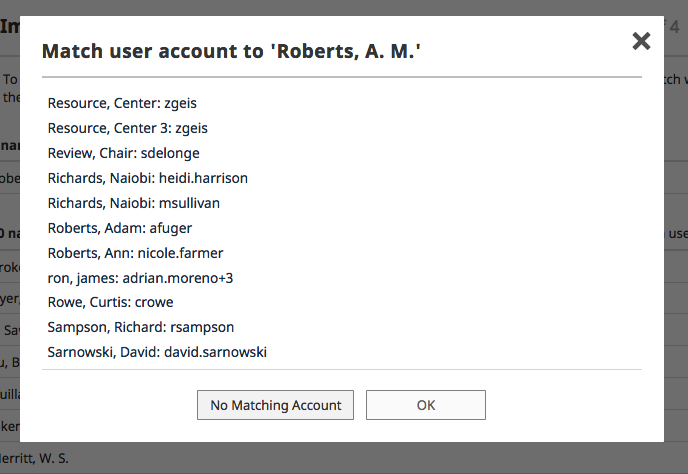 If there are multiple collaborators, you can select the Match to a user account link to make the proper assignment for each person's name. Note: In order to proceed, you must resolve all of the names that are from Possibility A above, where a name matched multiple users. 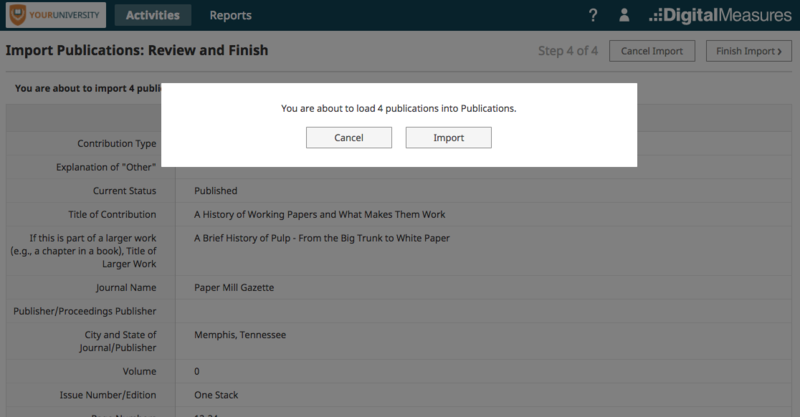 This step enables you to review the publications that you are about to load to ensure everything looks good. Use the forward and reverse arrows to move through the publications. When you are satisfied, select the Finish Import button. Activity Insight presents a confirmation box to ensure you wish to proceed. Select the Import button to continue. The records are loaded into Activity Insight immediately and you will see the text X records successfully imported. For answers to questions not listed here, please contact us.